For over twenty-five years Gary A Kessler has represented the seriously injured as well as wrongful death heirs (i.e. those who have lost a beloved family member) in an automobile vs. tractor-trailer rig(s) (Big Truck) collisions. We specialize in difficult automobile vs. tractor-trailer rigs (i.e., tractor-trailer rigs and big rig trucks) collision cases. 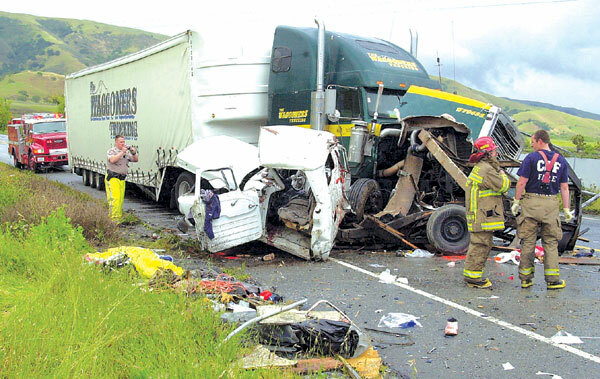 Severe injuries and fatalities occur in a truck (big rig) accident. Blunt head trauma, spinal cord injuries and amputations are common injuries associated when trucks carrying heavy loads collide into other cars. The Law Offices of Gary A Kessler represents trucking victims throughout California killed or seriously injured in wrecks caused by truck driver negligence. Our office takes immediate action, conducting our own investigation, consulting with nationally known accident reconstructionists, interviewing eyewitnesses and obtaining the truck driving records. Due to the fact that the trucking industry is regulated by state and federal law, these trucking firms are required to follow procedures to ensure the safety of others. It is important that you hire experienced trucking accident lawyer Gary A Kessler who has handled personal injury cases involving truck accidents for twenty years and has the comprehensive knowledge of the trucking industry. In Defendant, et al. v. the Estate of Doe Trucking, et al., Plaintiffs filed in Nevada, (which is the only state which still has a long arm statute) due to Nevada’s favorable wrongful death damages statutes (joint and several liability for special and punitive damages). Defendants attempted vigorously to have the trial moved to Barstow, California where the accident occurred. The Nevada Supreme Court heard Plaintiffs oral arguments regarding “forum non-conveniens” and ruled in Plaintiffs favor, so the trial proceeded in Clark County, (Las Vegas) Nevada. A tractor-trailer rig traveling eastbound on Highway 58 (in California) was transporting three seven and one-half ton (7-1/2) massive concrete pipes which were loaded in a pyramid position by Northwest Pipe. As Defendant truck driver attempted to negotiate a curve, the 4×4 dunnage (wood) supporting the pipes penetrated through the flatbed trailer’s wood floor, causing the pipes to shift which caused the four inch straps to break off. The pipes became dislodged due to inadequate loading, inspection, defective/worn straps, therefore, the pipes were ejected off the flatbed landing 150 feet in the opposite direction of traffic, landing directly on top of the Nissan Minivan, killing decedants upon impact. Plaintiffs proceeded to trial in Clark County, Nevada (Las Vegas) After two and a half years of litigation and nearly one month in trial, the Law Offices of Gary A Kessler was responsible for negotiating a $10,500,000.00 settlement in a multi-party wrongful death case. Our case received global media attention and was covered by the L.A. Times, S.F. Chronicle, U.S. News, Las Vegas Review Journal, Orange County Register, as well as by CBS, NBC, and ABC. Law Offices of Gary A Kessler provides sophisticated and innovative legal strategies for almost any type of fatality, wrongful death and/or serious injuries. We not only handle wrongful death and serious injuries but also traumatic brain injuries. Our office has undertaken difficult to next to impossible cases and prevailed, convincing the skeptical insurance companies of the merits of our client’s viable claims. From stolen vehicles, to tractor trailer rigs which have lost their loads, to professional truck drivers under the influence who have fallen asleep behind the wheel, to backing up over a Plaintiff wife and killing her, our office has represented hundreds of clients in truly tragic circumstances. Many times the official police report does not outline the true circumstances of what has occurred. Our office many times has discovered witnesses which law enforcement neglected to interview and have turned the case around in favor of our clients. Too many lawyers rush to simplistic results only looking at the bare bones insurance policy of the Defendant truck driver. The Law Offices of Gary A Kessler will consult with you about all of the potential defendants (i.e., truck driver, the contracting party for the load being delivered, the party who loaded the truck, owner of the trucking firm,etc. ), whether the roadway created “dangerous conditions” for the driver involved, were there steering and/or brake failure, did the restraint system operate free of defect, did the fuel tank fire cause the majority of injuries, etc..
Demand accountability from the trucking company. We at the Law Offices of Gary A Kessler have handled complex trucking accident cases for twenty-five years. We have the litigation experience to handle complex trucking liability cases. We are prepared to front all costs required for the necessary investigation and expert witnesses needed to prepare your case for trial. Remember, the trucking industry are a formidable foe and must be fought against aggressively. The laws regarding wrongful death/”trucking accident” cases are complex and include many facets of the law. It is vital to surviving family members to seek the advice of an experienced wrongful death/”trucking accident” lawyer such as Gary A Kessler at the Law Offices of Gary A Kessler to protect your legal rights and those of your loved ones. California trucking accident attorney Gary A Kessler and the Law Offices of Gary A Kessler are compassionate and fully understand that you are attempting to cope with extreme grief and sorrow associated with the loss of a loved one. The Law Offices of Gary A Kessler carefully selects its “trucking accident” cases so that we may give you (the client) the substantial personal attention necessary to obtain a successful result for your “trucking accident” case. If you have been seriously injured or a family member sustained fatal injuries involving a tractor-trailer rig you need to contact the Law Offices of Gary A Kessler or another experienced law firm immediately to protect your rights and preserve the evidence. The laws and time limitations can be complex so protect your legal rights by contacting the Law Offices of Gary A Kessler today.